Case will have wear, may have price stickers or security tape remaining. Discs have not been tested, but all discs are cleaned before shipment and guaranteed to play or will be refunded in full. This item was a donation to Goodwill of Greater Washington. Thanks for your order from Goodwill of Greater Washington. Very Good. Very Good condition. Audio CD. 2 disc set. Case Good. Case cracked/scuffed. Quality guaranteed! In original artwork/packaging unless otherwise noted. Sergey Rachmaninov. Very Good. In very good packaging. 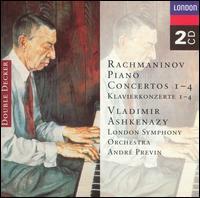 Rachmaninov: Piano Concertos Nos. 1-4.